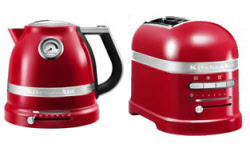 Best kettle and toaster sets that are trendy! Even kettle and toaster sets can be trendy! Functional and beautiful, make your kitchen look cool today. I’m sure you do too because you are here. Just because these things are functional it doesn’t mean they can’t be great to look at. So if you are in the market for a new kettle and toaster set then here are some of the best and nicest ones available. Here I have collated some of the best ones based on; how they look as well as specification, reviews and price. These aren’t necessarily the cheapest, you get what you pay for so I’m afraid if you are doing a bit of bargain hunting you are on the wrong page. This is more about style but still getting fair value for money. Consider your colour scheme and feel of your kitchen, so you can get the appropriate kettle and toaster that will make your kitchen look even better. When I’m on my break when working from home it does feel good to use nice appliances. I love the dark blue colour, or perhaps it is purple, whatever it is a gorgeous rich colour. The company say, “attention to every detail is the signature of the range,” they have also put the SureGrip finish so it is a tactile experience. I like the chrome especially on the kettle, has a really nice contrast to the dark colour. This is only for those with deep pockets! But if money is no object to you then this is like buying the Rolls Royce of kitchen appliances. Here I picked the ’empire red’ version but they also do them in ‘medallion silver’, ‘onyx black’ and ‘frosted pearl’. If you are spending such a big wedge of cash probably best to get in touch with the company to view them first before checking out, could be an expensive mistake if you dont like them! They look fantastic though, but I suppose they should at this price point. Morphy Richards make these really cool kettles which have a funky bulb-like shape with a big rounded handle. They are quite popular, I have seen them a few times and always thought how good they look. This colour is cyan blue but they do others too if you don’t like it. The 4-Slice Toaster has a simple rectangle design with a rounded top. I have based this list on kettle and toaster sets for sale in the UK, but they may also be available in other regions, or at least similar models if not these exact ones. For simplicity I have linked to Amazon but if you don’t like shopping there be sure to check other places like John Lewis and Curry’s which can be good. If you click and buy from Amazon I will earn a small commission as an affiliate, it makes no difference to the price you pay and is much appreciated. It helps me make sustainable profits from the website without having to rely on nasty large ads everywhere! There are also some individual ones you can buy, Smeg have some gorgeous appliances but I couldn’t find them in a set so I didn’t include them here. Try making your own set if you can’t find what you need, it will often work out more expensive, but value for money is what matters with long-term products so think about design and buying quality for durability. This list is my own choice so keep looking around if you don’t like them, remember you can always return them to the retailer within a few days if you don’t like them, provided they haven’t been used. These are a much better option compared to the tacky plastic white ones you get, not only will these look cool but should last a long time too. Thrifty living isn’t always about buying the cheapest! Happy tea drinking and toast eating. And be sure to keep them clean so they stay looking classy for longer. Best small microwave ovens for tight kitchen spaces!